The Greater Philadelphia Section of AIAA hosted the region?s technologists, scientists, managers, engineers, students, and educators for an intensive day of scientific interaction at the 2011 AIAA Greater Philadelphia Regional Aerospace Engineering and Technology Symposium on Friday, March 25. Students from Lehigh University, Princeton University, Drexel University, Rutgers University, the University of Pennsylvania, Northeastern University, Georgia Tech, and the University of Maryland (UMD), as well as a number of Young Professionals, descended on Lockheed Martin?s Patriot Center in Newtown, PA, to present their research. The symposium featured sessions on Advanced Controls and Communications, Air Platforms, Next Generation Aerospace Technologies, and Advanced Materials, as well as various other Tidbits. In addition, Lockheed Martin hosted an Exhibition for attendees. A keynote lecture was delivered by Dr. Mark Lewis, AIAA President, and the Willis Young Professor and Chair of UMD?s Dept. of Aerospace Engineering. 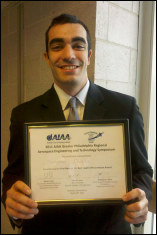 Mr. Jonathan Geerts, a senior in UMD?s Dept of Aerospace Engineering, was awarded First Place for his presentation entitled ?Establishing a Nusselt Number Correlation for Small IC Engine Cylinder Head Heat Transfer.? This research was conducted under the advisement of Prof. Christopher Cadou.